As urban populations everywhere continue to diversify, creating thriving, inclusive public spaces is essential to ensuring livable, sustainable cities of the future. This is particularly urgent for immigrant communities that often face barriers to inclusion. Integration can prove all the more challenging when professionals fail to create spaces where various cultures can thrive in a respectful environment. PPS’ recent work in Plein 40-45, a square in one of Amsterdam's most diverse districts, has shown that a Placemaking process that incorporates the needs and desires of a diverse community can go a long way to catalyze quick improvements and promote true livability. ‍The workshops PPS facilitated this fall brought together diverse cultural groups to envision a bright future for this space as an inclusive town square. 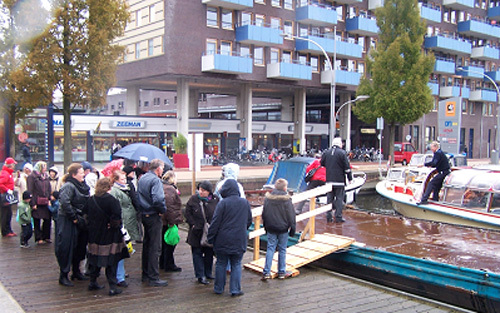 In September 2010, PPS facilitated a workshop with local stakeholders around Plein 40-45, the central square of the garden city Geuzenveld-Slotermeer on the western edge of Amsterdam. The workshop brought together a diverse group of neighbors and led to a number of short and long term strategies for improvement; many of which have already been implemented. Before the workshop, many local government representatives and stakeholders had not met and had perhaps not realized the incredibly rich and diverse resource that the community represented. 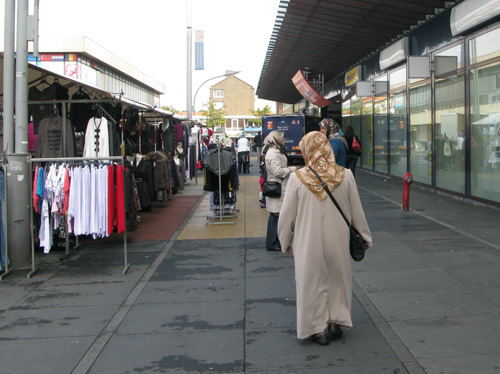 During the past several years, Geuzenveld-Slotermeer has become a place where Turkish and Moroccan immigrants have moved and opened businesses along with existing Dutch residents and retailers. A testament to this evolving population mix is the story of the recent opening of a grocery store named Tanger on the second floor of a building on the edge of Plein 40-45. The day the store opened 1000 people lined up in the Square to wait to enter, even though the store had done very little to advertise. Why? The store carried products that appealed to and reflected the changing population of the community and were sold in a friendly, market-type environment. 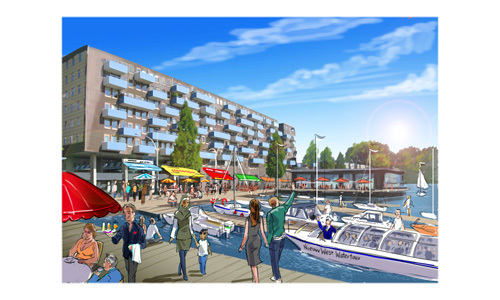 A vision of the future of Plein 40-45. Located on a canal, Plein 40-45 is reachable by boat from the center of Amsterdam. Today, the Square is somewhat underused but does feature a market where vendors sell a variety of products ranging from fruits and vegetables to clothing, rugs and other dry goods. The recent workshop unlocked a vision of the Sqare's potential as a town square. Rather than trying to come up with changes for the Square as a whole, the space was broken down into 5 sub-areas. During the workshop, small groups of about 5 people evaluated one small part of the Square, talked to people who were using it, and came up with ideas for short and long-term improvements. The community has already tried out many ideas that emerged from PPS' workshop. The day after the workshop, one of the participants suggested changing the name of Plein 40–45 to “Freedom Square" (the square was named Plein 40-45 in 1955 to recognize the German occupation from 1940-1945). Just one month later, Plein 40-45 became one stop on Amsterdam's Annual 1001 Markets Tour. Government employees developed sketches to visualize new activities that could occur on the Square and additional meetings were held with stakeholders. What is the message here? When a diverse group of stakeholders come together to evaluate a small part of that place, they can build a shared vision that can produce meaningful changes very, very quickly. Margaret Mead's words still ring true: “never doubt that a small group of thoughtful, committed citizens can change the world. Indeed, it is the only thing that ever has."